... At least, for those of you who happen to be in the Netherlands in November and/or December. The first, in November, will be all about Pattern Magic. 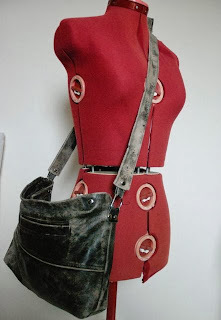 On two Sundays, 10 an 17 November, I will do my best to get anyone with a bit of sewing experience started, not just on using a Pattern Magic book, but especially on bending the instructions to your own needs and wishes. Of course, we can only do so much in two days but everyone should be going home with a finished garment. The second one, on 15 December is also doable for the rookie seamstress. It's about "up-cycling" and more specifically, about making bags from old clothes. You know, like I've been doing here. Everyone will be working on his/her own project so it can be as easy as you need as difficult as you want. Anyway, it's all about re-creating your trash into treasure. Both workshops will take place when there are two or more participants. You can find out more about them and sign up here. Little progress was made on E's robe over the course of this past week. I cut out the fabric last Sunday. This took a lot of time because I always seem to forget just how time-consuming it is to match checks... 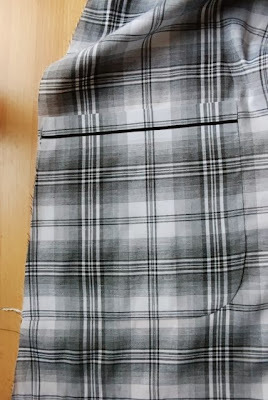 Even if I only matched the side seams and the front edge and front facing horizontally, to avoid using even more fabric. The thing already took almost five meters and those front pieces, with their A-line and overlap were just a bit too large to cut out of folded fabric. 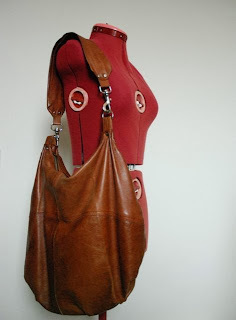 After that, my work-week didn't leave any time or energy for sewing in the evenings. Today, I could finally start sewing. 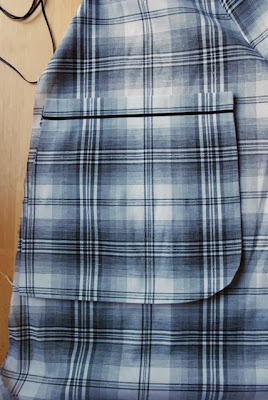 I started with the pockets, which I had cut carefully to match their position on the front pattern pieces. 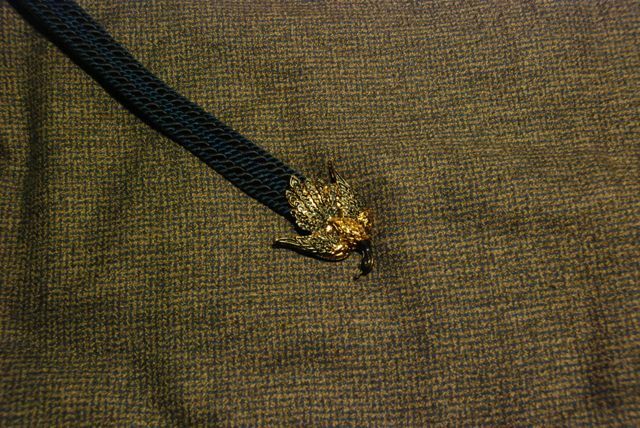 I interfaced the pocket facings, serged the edges, stitched the facing down and applied a bit of very thin ribbon at the front. So, I tried ironing the front. That helped a little. 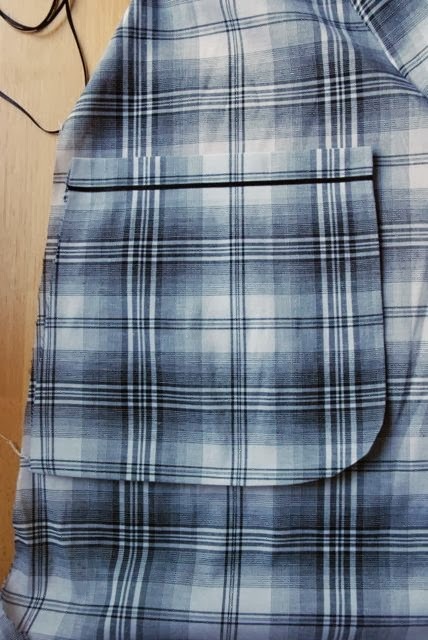 Between the ironing and the stretch, I managed to apply the pockets kind of the way I had meant to. I showed it to E and he claimed the pocket edges were only visible when he looked closely. That's kind, but I know it could have looked much better yet without the shrinking. Hopefully, I'll be able to finish the robe tomorrow. This week, the second-hand stall at my local market had put some belts in the "50 cents an item" bin. I like wearing belts with my 50's style dresses so of course, I had to have a look. Unfortunately, none of these look great in lamplight but the flash version was even worse. And then I found the blue one. Vintage looking, ever-so-slightly kitsch and oddly amazing. One of the geese had come off, but it was obvious to me that I would be able to put it back on (which I already did before taking the picture). 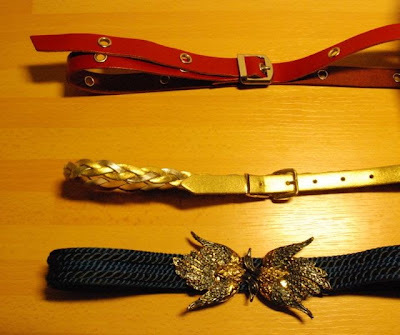 The belt itself has a grossgrain back and the front is made up from two kinds of decorative rope. The geese might be brass and are painted. The paint has rubbed off a bit. This grey and blue check/houndstooth flannel is something I bought at the end of last winter. It was just waiting for the change of the seasons and is sort of earmarked for a 1949 style shirtdress with a straight skirt and a drape/flounce detail... Which may just go very well with the over-the-top geese belt, don't you think? You would guess that all the new inspiration for autumn would have send me straight back to the sewing machine after my holiday, wouldn't you? Well... Not so much. I've been sewing all right, but only at work. Which has been pretty crazy this past week and will continue to be so for another two weeks. But tonight, I plan to start a new project. It going to be another bathrobe/morning gown/house coat but not for me. It's for the man in my life. 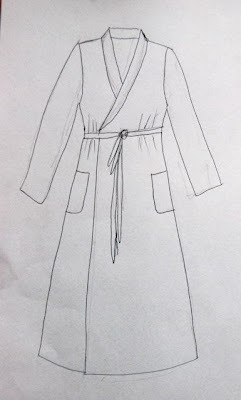 I made E a very simple cotton robe a couple of years ago which he has worn a lot. However, I was cutting frugally back then and as a result, it has always been a bit on the short side. And it doesn't have quite as much ease and/or overlap as he'd like. This is going to be a more elaborate version. I planning on making something like this. Ankle length, with a shawl collar and a generous A-line shape, closed and cinched with a waist tie. 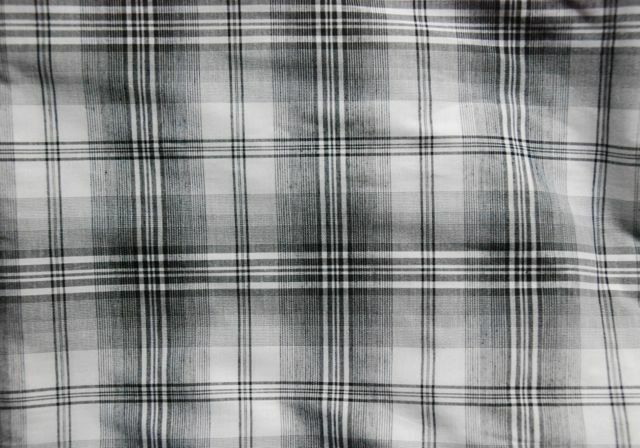 And this is the fabric I'll be using. 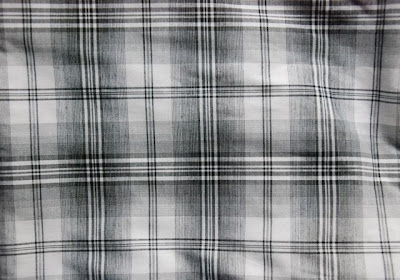 Rather nice, shirt weight, cotton in a black-and-white check. And maybe I'll use some thin ribbon to accent that collar and make the tie in plain black fabric. I think this robe will meet E's needs nicely. 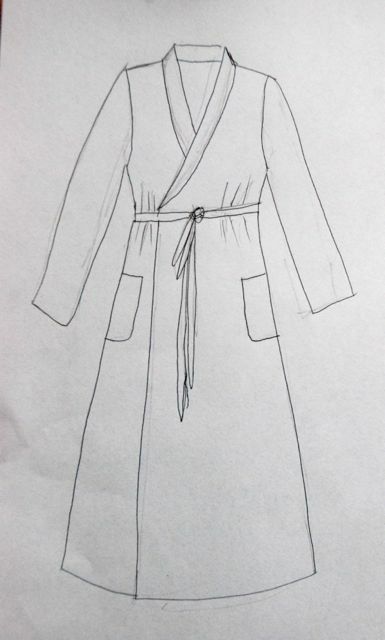 I looked at some robe patterns and tutorials (for both men and women) and was surprised to find that nearly all of them had a completely straight body shape. This may be fine for a knee length version (which, of course, many are) but I think it would make for an over-fitted skirt in a long one. I'm going to start on the pattern tonight. I hope to show you the end-result in the coming week. As a result of the idiosyncrasies of my job (most people get married in summer, with June being the most popular month), I tend to go on holiday rather late in the season. When I left for Austria two weeks ago, stores were already being filled with autumn clothes. Now that I'm back (after two weeks of hiking, rafting and visiting caves an castles) I feel ready to take a good look at those. And I'm already dreaming of all those things I'd like to make in the months to come. Let's talk collections first. Strangely, I don't think I've read posts about those on any other sewing blog yet. Apparently, this season hasn't produced a "must copy" item. I don't always look at the high fashion stuff, but when I do, it's much more often in autumn than in spring (as in autumn collections, which are, of course, actually presented in spring although fashion magazines will only discuss them at the start of the season they are for). I guess that has something to do with my love for tailoring, wool fabrics and rich, dark colours. I generally prefer to look at collections on paper, in a magazine but this time I went to style.com which makes it easier to share some of the things I like. I will confess immediately to only looking at a few collections. Just stuff I had read about in a magazine and some brands I often like the look of. First up: Did you hear about the sort-of tribute collection Christian Lacroix made for the house Schiaparelli? They're going to have another designer do that each season from now on. The collection has a lot of the usual suspects: Long-haired fur, lobsters, shocking pink. And yet, it does manage to look like Lacroix and Schiaparelli at the same time. This green dress was the only item I really liked. Then, Dutch Vogue was very positive about Prada. They even drew some sort of comparison to the New Look. Why? I have no idea. If you ask me, the collection is fine but they've done much more striking stuff in recent years. 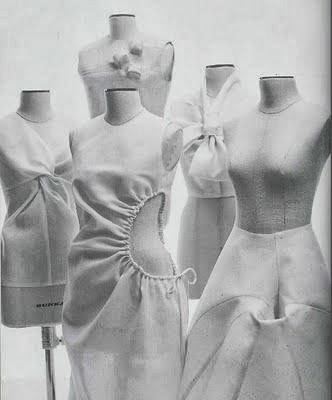 There was some inspiration for my own sewing sewing though. Like these jackets: High neckline separating zipper, and a colour contrast. In the first picture, it looks like patch pockets, in the second one like a wide rib knit band. It's probably the latter, but I like the first idea for green tweed in my stash (I already made a much-worn jacket from it. It's too heavy for a dress or skirt and I don't want re-do the same look in the same fabric). How about moss green tweed with deep yellow pockets? Red or bright turquoise would be nice too, but I don't have wool fabric in those colors in my stash. And then there was this neckline on a couple of tops and dresses. A boat neck with a center front closure with big buttons. Feminine and tough at the same time. 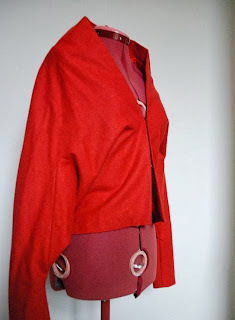 I quite fancy this look for a big-skirted 1950's style dress in a warm winter fabric. Then, I took a look at Dior. There are some nods to the classic looks of the brand. I especially like the suit. But this outfit was part of the same show. I don't really get that. And I personally wasn't a fan of the painted-on shoes (I read the review, I know it was a reference to Warhol). And then something completely different: I rather like the work of Haider Ackermann. Have done so for a couple of years. There's always such strength to his collections. And no matter how much I love skirts, there's something refreshing about a high-fashion collection made up almost entirely of bifurcated outfits. Of course, most of his looks are quite draped and layered so they have very little in common with my personal esthetic. That said, I would wear this outfit. In fact, I've made garment in the past which could add up to a sort of light-version of this look. And is he doing jumpsuits in different shapes? I can't really tell from the pictures the outfits are pretty cool. These were my picks from the AW 13/14 collections so far. They may or may not end up having some impact on my sewing plans for the coming season. Do you ever look at runway collections for sewing inspiration? And which are your favorites? Hi everyone, a question: Do you sew for exercise and/or serious outdoor activity? And do you think it's been worth your while? I know Melissa makes her own running gear, and so do several other running seamstresses. The only blogger I know who sometimes makes outdoorsy stuff would be Carolyn. Me? Well, to be honest, for most of the year, I'm not really the sporty type. I do indoor rock climbing occasionally (used to be a regular thing but when I and my climbing buddy moved from art school to working life, we couldn't match up our schedules anymore) but that's about it. When on holiday though, I love to be active in the great outdoors. Mostly hiking but I'm definitely open to other options. Climbing, caving, canyoning or rafting? Where do I sign up (often, I don't get around to doing as much as I'd like because we mostly go on holiday outside the peak season and sometimes move around a lot)? So, where sewing is concerned, I make stuff for my every-day not-on-holiday life and odd things I just want to make. For my holiday activities, I have the necessary gear (hiking shoes, climbing belt and shoes), sometimes buy what I think I'll need (this year: a couple of sports bras) and otherwise make do with the more casual of my me-made clothes. 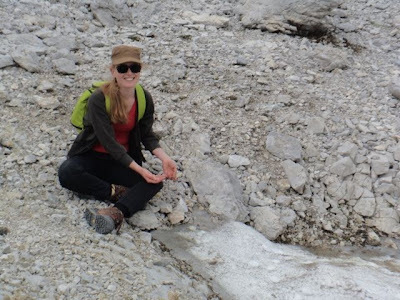 Here I am in a picture E took of me while we were hiking up the Eiskögel (a mountain in the Alps south of Salzburg). We took this picture as proof we got all the way up to where the snow was. This is view from that spot. 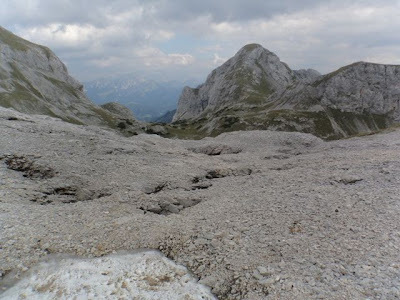 Any readers from countries with proper mountains of their own may laugh, but for flat-land-dwellers like we are, walking up this far is impressive. On this hike, I was wearing my fitted black twill trousers, red V-neck top and, when we got high enough to get cold, my raglan sleeved cardigan. And in my case, the question is probably: If I didn't sew, would I buy special clothes for those few weeks on holiday?